Viewsonic recently released the Gtablet to the masses at the $399 pricepoint. 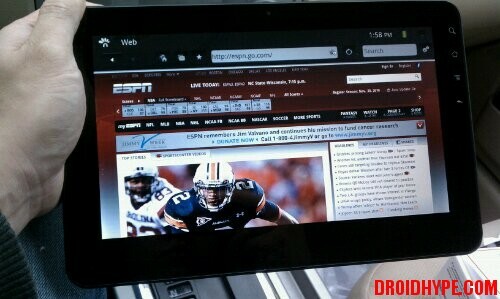 With a dual core Tegra cpu, 512MB of ram and 10″ of screen real estate, this tablet has a lot going for it. However, right out of the box it is probably by far the worse OS and/or UI I have ever used. If this tablet was given to me as a gift with no option to change the stock OS, I would try and re-gift it. It is just that bad and then some. So what’s so great about this tablet then? Custom roms. There’s nothing locking this system down, so there are already a few roms available that really improve the functionality of this tablet. Trust me, the difference is night and day and all kudos go to the folks on XDA Developers for really pushing this tablet forward. Before we dive in, this guide is written with the understanding that you know how to load anything via the update.zip method. Basic understanding of how recoveries work will get you very far on this journey. We will focus on loading TnT Lite 2.2.0, which is a modified/stripped/cleaned version of the rom that comes stock on this tablet. There’s really nothing similar to the stock OS besides the name. It is a totally different beast once you are done. The superuser app and su binaries are all included, so this rom on your Gtablet will give you root access. You can even load this rom using the stock recovery – that’s how easy this tablet is to work on. However, we’ll discuss the use of Clockworkmod recovery since it’s far more useful when something goes wrong. Before starting, make sure your tablet is charged and ready. You do not want the power to go out while you are flashing the recovery or rom. Download the modified Clockworkmod (CWM) Recovery below (via XDA). Now rename this file to update.zip and move it to the root of the /sdcard. For this tablet, the /sdcard is referring to the internal memory. Your external memory is mounted at /sdcard2. Once moved, shut down the tablet and then turn it back on by pressing volume + and the power button. You will see a message to the upper left saying a recovery button has been pressed. The screen should flash by to the stock (exclamation point) recovery and then reboot on it’s own. Shut down once again and perform the same volume + and power combination to turn it on. You should now see a recovery screen showing Clockworkmod. Before we load the custom rom, perform a nandroid backup. This will give you a backup plan in case something goes wrong or if you plan on returning your Gtablet. Grab the latest version of TnT Lite by roebeet over at XDA. As of this writing, it is version 2.2.0. There are a few caveats to the install, but they are definitely not deal breakers – at least not for me. Once you download the .rar file, unpack it and you will find the update.zip file inside as well as a command file. This is done this way to allow the package to be installed by the stock recovery. Since we are using CWM, the command file is not needed. You also can’t flash a .rar file anyway. Take this update.zip, which you can rename, and place it anywhere on the /sdcard. Again, this is the internal memory we are talking about. CWM comes with the option of installing any zip in any directory. This makes it pretty easy to keep track of your .zips within sub-folders. After you successfully downloaded and moved your zip to somewhere you remember on your /sdcard, reboot into recovery using the volume + and power combination. In CWM, we are going to wipe data and cache first just to be safe. Scroll down to those options using the volume keys and select it using the “home” key. After wiping data and cache, use the volume keys to scroll down to the the sdcard zip installation option. Use the “home” button to select it. Now find your TnT Lite zip and install it. You can reboot once it tells you it has completed the install. The initial boot may take a bit longer than you are used to. This is normal so please be patient. If you see the X bootanimation, you are in very good shape. Once you are back to your homescreen; pat yourself on the back because you just completed the recovery and root process. There are a few things that need fixing like the Market, Flash support, etc. after you get back to your homescreen, but I’ll detail those in a future post. Rename it to update.zip. The post has been updated with this info. Thanks for the catch! It just wont reboot to clockwor mode?? it loads fine and reboot automatic. but it dont start up the clockwork mode when i reboot it againg? If you hold volume + (up) and power, it doesn’t go into recovery?